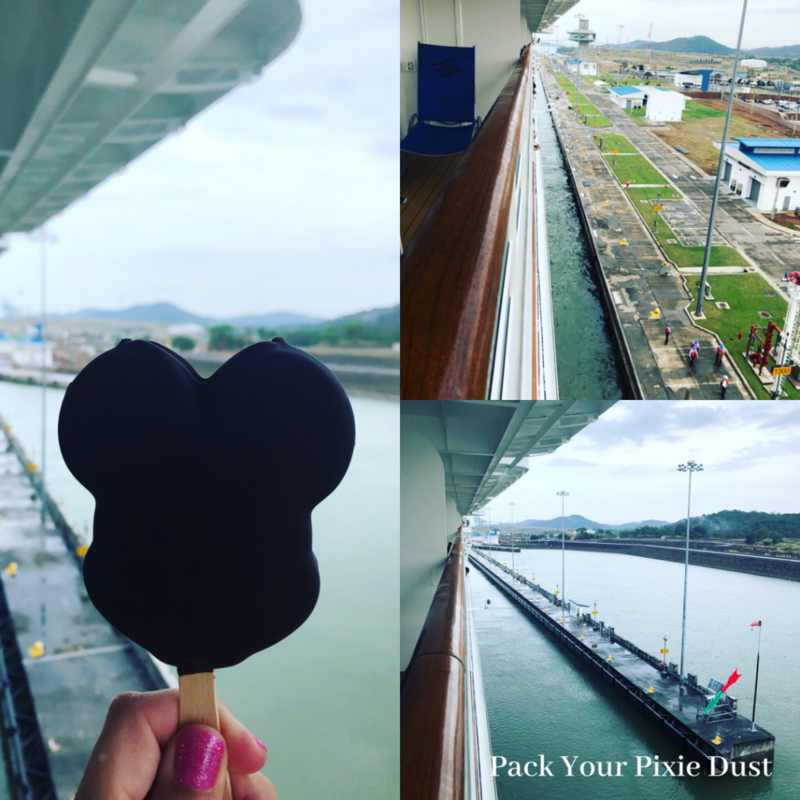 We were fortunate enough to experience cruising through the Panama Canal on Disney Cruise Line. 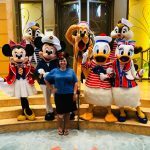 I’ll touch on a few of my favorite things as well as the unique experiences of a longer specialty cruise on DCL. This was a long cruise in the making. We booked it on opening day (the day Disney Cruise Line releases the itineraries), 500 plus days before the cruise. It was worth the wait. We absolutely LOVED this 14 night cruise through the Panama Canal! One difference from other DCL cruises right from the start is that you need a passport to take a full transit panama canal cruise. Anytime you are doing an open loop cruise, cruising from one U.S. port to a different U.S. port, a passport is needed. [Most Disney Cruises are closed loop cruises. (Sailing to and from the same port in the U.S. For those sailings, a passport is not needed, but it is recommended.)] Our cruise left from Port Canaveral, Florida, and ended in San Diego, California. We cruised west April 8th through the 22nd, 2018. Cruising was myself, my husband, our almost 5 year old and my mom (in her own cabin.) I was a little prepared for one of us to be bored at some point but that was never the case. I actually brought a bunch of things with us to do, but as with any Disney cruise, there was too much to do. Dining was as it normally is on a Disney Cruise. Rotational dining where you dine in one of the 3 dining rooms each night based on a predetermined schedule. As usual, your servers rotate with you. For each of the 14 nights we were offered different menus. Some items would re-appear- like prime rib, but it was named something different and usually accompanied by different sides. Included were the same rotational menus that are on all DCL cruises, plus a host of others. Overall we enjoyed our meals during the cruise. Our favorite dining location overall was Tiana’s Place. We loved the live music and the vibe here. One night during the Mardi Gras party, my typically shy son got up and danced with our assistant server. As always I had to dine gluten free and did so with no issues! Our head waiter really was fantastic. Early on during the cruise I requested gluten free beignets for our Mardi Gras night. They weren’t sure they would be able to provide them but I joked that it was a long cruise and they had time to figure it out. 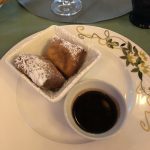 I also advised them that they could ask the chef in WDW for the recipe since they served them at Port Orleans French Quarter. And, as you can see from the picture, I was successful in enjoying my gluten free beignets! My other favorite was the fried brie. They brought me this appetizer several times during the cruise since I enjoyed it so much. The most unique entertainment in my opinion is the opportunity to see multiple characters at once. There were 2 instances where there were multiple character opportunities one could pose with. 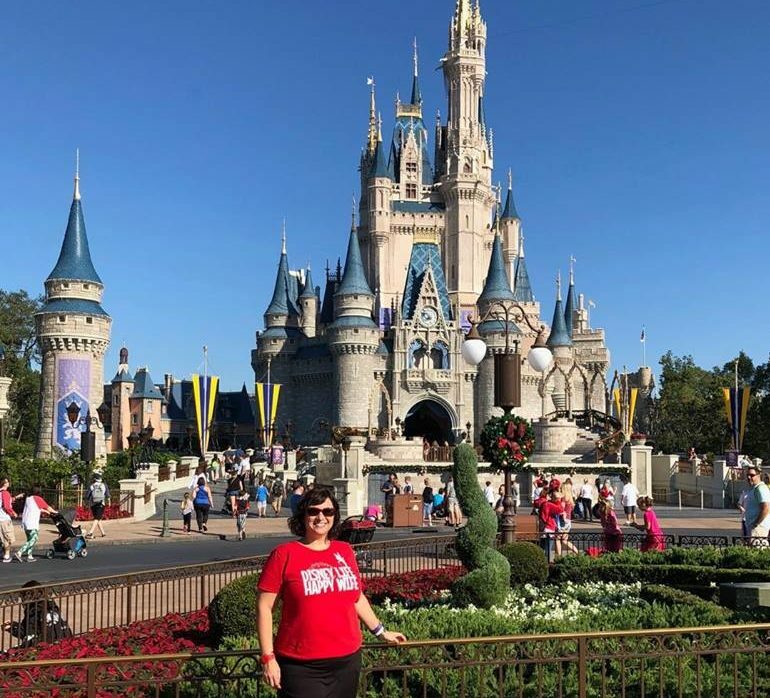 Disney had the following rules for these occurrences: there is only one photo combination taken per family, and they closed the line 15 minutes after the posted start time. Regardless of the length of the line, Disney would get to every family, but you MUST be in the line within the 15 minutes of the start time. As for the photo combination, you could not separate kids from parents or other fun combinations. Whoever was present from your cabin to take a picture needed to be in the same picture. Disney advertised these special character experiences as “Mickey and Friends.” During our cruise, we had one on Pirate Night and one other opportunity. During this cruise, they also had unique characters not often seen. There were many Marvel characters as well as combinations, like Minnie and Daisy together, Jesse and Woody, etc. This was a highlight for me! Disney also brings on a unique guest to their longer cruises. 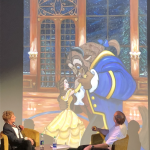 We were fortunate to have Paige O’Hara, the voice of the original Belle in Beauty and the Beast. She was on with her husband, Michael Piontek. They are both Broadway stars and just seemed so genuine. They did 3 packed house discussions. Two of the talks were just them talking and for the third, they did a question and answer session. THEY WERE CAPTIVATING! The Kid’s Clubs also had some unique experiences. They had a slumber party one night for kids. This is a no charge event but you need to sign up your kids on the first day. It quickly reaches capacity. The kid’s club also did a couple of late night, adult’s only parties at the kid’s club. I know one night they made slime! They really did use the longer cruise to come up with some unique opportunities for everyone to participate. This was my second time doing a Panama Canal Cruise and I think this is still my favorite cruise location. I LOVED IT. We all loved it. But the day going through the Panama Canal was my Super Bowl. It was so special! If you want to hear a more detailed recap our our cruise, listen to my trip report on the DCL Podcast. If you listen to podcasts on iTunes, you can find the link here. Is this cruise on your bucket list?? Comment below.